← Only finding property corners? 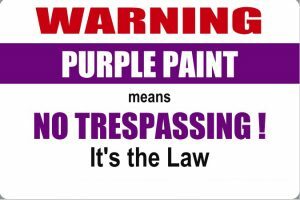 Effective July 1, 2017, rather than buying no trespassing signs, a landowner only needs a can of paint. I don’t see that there is a specific color purple, but I would guess that, like Missouri and Arkansas who have had this in place for decades, there will eventually be a specific blend. For now, you only need to paint a purple (any purple) stripe at least 1″ wide and 8″ long between 3 and 5 feet of the ground. Having painted a lot of trees in my time out west, I can say that the 1″ thing isn’t going to be a problem. It would appear that the average width of a t-post would meet this requirement. Now, before you drive your new fence posts, you can dip them in 10″ of paint and voila, instant no trespassing posting. (a) A person commits criminal trespass if the person enters or remains on property, or any portion of property, without the consent of the owner. Consent may be inferred in the case of property that is used for commercial activity available to the general public or in the case of other property when the owner has communicated the owner’s intent that the property be open to the general public. (3) The person immediately left the property upon request. come to the attention of a person entering the property. (d) For purposes of this section, “enter” means intrusion of the entire body or when a person causes an unmanned aircraft to enter that portion of the airspace above the owner’s land not regulated as navigable airspace by the federal aviation administration. (e) Entering or remaining on railroad or utility right-of-way property by an adjoining landowner for usual and customary activities of the type defined in งง 1-3-105(2)(A)(i) and (ii), (B) and (C) and 43-1-113(a), (b)(1)(A) and (B), (b)(2) and (b)(3) shall not be considered trespass under this section. This subsection (e) shall not apply if the railroad or utility right-of-way owner, by a personal communication or posting at the site by someone with either actual authority or apparent authority to act for the railroad or utility right-of-way owner, has communicated to the adjoining landowner that the activity is not permitted. (f) (1) The secretary of state shall establish a no trespass public notice list identifying employers in this state who have requested established private property rights to be recognized and recorded against a trespasser under subsection (a). (2) To be included on the list, an employer shall provide to the secretary of state copies of appropriate documents that establish the employer’s private property rights, including the address and legal description of the property to which it has legal control. An employer that records its private property rights shall pay a recording fee as determined by the secretary of state. (B) Distribute the no trespass public notice list to every law enforcement agency in this state. (4) Publication of the no trespass public notice list as prescribed in subdivision (f)(3) establishes a presumption that members of the general public have notice of the establishment of private property rights of all employers and properties listed. (B) May take appropriate and lawful action against a person committing criminal trespass to have such person leave the property or cease blocking ingress to or egress from the property. (6) If the employer’s property is listed on the no trespass public notice list, an owner may seek an expedited injunction to restrain repeated or continuing trespass. (7) This subsection (f) shall not affect or limit any existing rights of an owner whose property is not included on the no trespass public notice list. (g) Criminal trespass is a Class C misdemeanor. 62-18-124. Right-of-entry — Liability — Notice to landowners — Injunctions. (a) A professional land surveyor, the professional land surveyor’s agents, employees and personnel under the professional land surveyor’s supervision, may go on, over and upon the lands of others when necessary to perform surveys for the location of property corners, boundary lines, rights-of-way and easements, and, in so doing, may carry with them their customary equipment and vehicles. (b) A professional land surveyor, the professional land surveyor’s agents, employees and personnel under the professional land surveyor’s supervision entering the lands of others under the right granted by subsection (a), and doing no unnecessary injury, are liable only for the actual damage done, and, if sued in such case, the plaintiff shall recover only as much costs as damages. (c) Nothing in this section shall be construed as giving authority to a professional land surveyor, the professional land surveyor’s agents, employees or personnel under the professional land surveyor’s supervision to destroy, injure, damage or move anything on the lands of another without the written permission of the landowner, and nothing in this section shall be construed as removing civil liability for such damage. (d) A licensed land surveyor during the conduct of a boundary survey where there is discovered, or reasonably should have been discovered, any major apparent discrepancy as defined by the board between the deed descriptions of adjoiners, evidence of use or possession not consistent with deed descriptions or otherwise has notice that there is an adverse claim across a boundary, shall notify the affected adjoiners. Notice to nonresident or absentee owners will be by mail to the current address used for mailing property tax notices. In cases in which the landowner does not reside on the property, reasonable effort shall mean notification by certified mail. (e) No owner or occupant of the land shall be liable for any injury or damage sustained by any person entering upon the land under this section. (f) Injunctive relief may be had against a landowner restricting entry to the landowner’s land in violation of this section by petition addressed to the circuit or chancery court of the division in which the violation is alleged to have occurred. Do the purple stripes need to be directly painted on trees and posts or can they be a bit more elaborate. For example, can it be a purple metal sign nailed to a tree? This would look nicer in my opinion. The words “not less” implies that you may use purple “signs” that are at least 1″ wide and 8″ tall. If you want to use an 8×10 sign, that is up to you. This is a legal question. You will need to consult an attorney on that. I know that trespassing is trespassing whether is it posted or not. I know it doesn’t impede my ability to survey. As a surveyor in Tennessee, I am exempt from trespass laws (but I am liable for damages I cause). How this affects law enforcement, I cannot say. Are there any light trespassing laws in Tennessee? Like a neighbor who is lighting up the entire inside of your house with an unnecessary flood light? As far as I can tell, there are no state-wide laws regarding light trespass. I did find that Johnson City, TN has an ordinance regarding just this issue. You would need to check with your individual municipality or county government. Call codes enforcement for your area and ask. It may not exist – yet. However, if there is enough issue, your area may be willing to institute a policy. Begin with codes and then move to your elected officials to deal with it. What are requirements for Obion County ? Do you also have to have signs ? Do I have to put any marking signs at any points or do you just mark with purple paint? I want it to be legally posted. 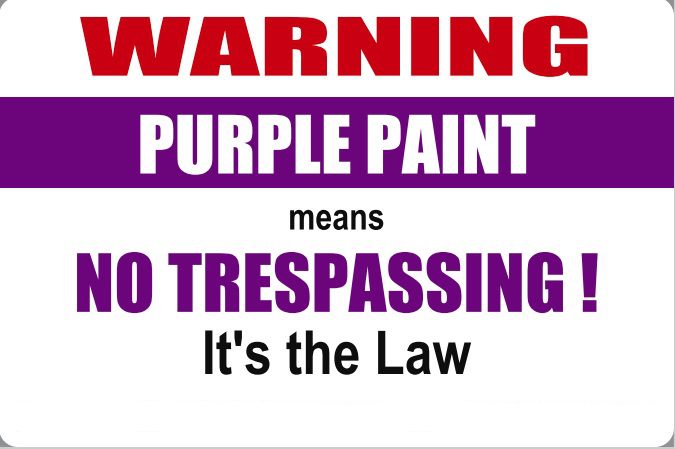 The law doesn’t specify, but it also doesn’t have an “and” between posting signs and posting with purple paint. What is suppose to be the distance or spacing apart of the vertical purple lines? come to the attention of a person entering the property.” This means that, if you can reliably expect them to wander in across any part of your boundary, you would likely need to have them intervisible. By that, I mean that crossing onto your property would mean that you could reasonably see two from any entry point. For me, in relatively open terrain, I would paint every 100′ or so. If I had a fence, I would paint the tops of every post (because I am OCD that way).